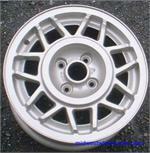 2028a, Used Rims, 15X6, 5 LUG, 100MM, 92-93, DODGE, SPIRIT, 10 SPOKE, 15 OPENINGS, PAINTED WHITE, ALLOY. 2054b, CENTER CAP USED, 95-96, DODGE, NEON, PAINTED WHITE METAL CAP, 4 METAL CLIPS, 2" DIA. 5110c, CENTER CAP USED, 98-99, CHEVY, LUMINA, MONTE CARLO, PLASTIC, PAINTED WHITE, CHROME CHEVY BOWTIE. 5 SETS OF PLASTIC CLIPS, 6-1/4" DIA. 69651a, CENTER CAP USED, 86-88, VW, CABRIOLET, FOX, JETTA, SCIROCCO, QUANTUM, ALPINE WHITE, RAISED WORD VOLKSWAGEN OUT TO EDGE, 6-1/2" DIA.